Albert Einstein is one of the most famous scientists in history. His greatest achievement is the general theory of relativity, which describes how the force of gravity works. It is the theory which explains why apples fall from trees, why we are all stuck to the Earth, why the Moon orbits the Earth, and the Earth orbits the Sun. 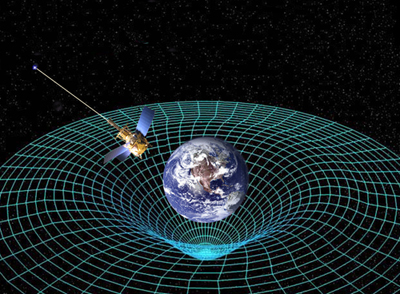 General relativity is one of the greatest achievements in the history of science. 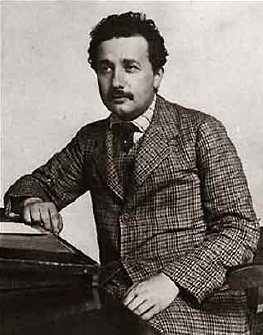 Einstein discovered general relativity in 1915 when he was 36 years old, but the seeds were sown in 1905. Einstein was quite a cocky young man at that time, and because he had annoyed pretty much every scientist he ever met, he didn't have a job at a university. Instead, he was working as a civil servant in Switzerland, on the lowest rung of the ladder as a junior patent clerk in Bern. The job left Einstein with lots of spare time to think about science. One of the things he produced in 1905 was the special theory of relativity. The central idea of the theory is that there is a speed limit in our Universe. The laws of physics conspire so that nothing can ever travel faster than light. Einstein was led to this idea by asking questions such as "what would a light beam look like if you were running alongside it?". We don't notice this speed limit of the Universe in our everyday lives because the speed of light is really fast: around 700 million miles per hour. Special relativity put Einstein in conflict with a theory that was then considered the bedrock of science: Isaac Newton's theory of gravity which had been around for nearly 250 years. Einstein wondered what would happen if the Sun were to suddenly explode. Since the Sun is so far away that it takes light eight minutes to travel to Earth, we wouldn't know about the explosion straight away. But what about gravity? The Earth moves around the Sun, due to the Sun's gravity. If the Sun wasn't there, it would move off in a straight line. Einstein's puzzle was when that would happen: straight away, or after eight minutes? According to Newton's theory, the Earth should know immediately that the Sun had disappeared. But Einstein said that couldn't be right. Because, according to him, nothing can travel faster than the speed of light — not even the effects of gravity. In case it's not obvious, we should point out that Einstein was not a pragmatic man. The Sun explodes and all he worries about is whether the Earth travels in circle or a straight line. But this was how he did science. He would cook up these scenarios in his head and just push them to the limit. He'd try to find some contradiction and when there was something that didn't make sense, that's what he'd focus on. At first Einstein thought he could fix the problem by tinkering with Newton's equations, but this didn't work. In 1907 Einstein started thinking more deeply about gravity, going right back to basics. It took him eight years to get to the final answer. Einstein first thought he'd cracked the problem in 1913 when he came up with what he called an "outline" of the theory. He realised it wasn't perfect, but he thought it was basically right and just needed a little polishing. For two years he tried to ﬁx it up, but somehow he just couldn't quite do it — nagging doubts started to creep in. In 1915 had to admit that his theory was rubbish. He got depressed at first, but then he buckled down and started from scratch. He worked for months, sometimes forgetting to eat or sleep. Eventually it got to November 1915. Einstein was due to give a series of four lectures — one a week — on general relativity in Berlin. He'd agreed to do this way back when he still thought he knew what he was talking about. But now he didn't have a theory. He managed to get together enough material to give the first lecture, but from then on, he was working in real time. During the week, he spent his time trying to solve the problem that he'd struggled with for eight years. At the end of each week he stood up and gave a lecture on what he'd just figured out. Finally, in the week before his last lecture, Einstein cracked it. At the end of the week he announced to the world the general theory of relativity he had figured out just days earlier. Einstein's theory changed our understanding of space and time. Before Einstein people thought of space as stage on which things happen. We could throw in some stars or some planets and they would move around on this stage. Einstein realised that space isn't as passive as that. It is dynamic and it responds to what's happening within it. 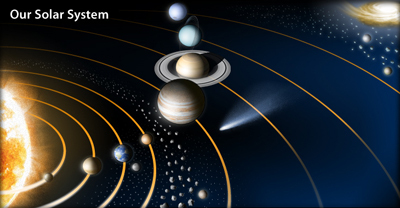 If you put something heavy in space — let's say a planet like Earth — then space around it gives a little. The presence of the planet causes a small dent in space (and in fact, in time as well). When something else moves close to the planet — say the Moon — it feels this dent in space and rolls around the planet like a marble rolling in a bowl. This is what we call gravity. This may sound like something you'd see in Star Trek, but it's not. It's the way our Universe works. A hundred years on, there is no doubt amongst physicists that the theory of general relativity is essentially correct. In the world of science Einstein's legacy can't be overestimated. What's so special about special relativity?